When Chelsea first came to me, she told me that she and Jason wanted to have an outdoorsy, laid-back wedding but still have some feminine, romantic touches to it. Pineridge Hollow was totally the perfect place to host their wedding, and the flowers and colour palette really brought everything to life. One of the best parts of Chelsea's bouquets was that almost everything was locally grown. Just a bit of the greenery and the roses came from outside of Manitoba! Bridal Bouquet Ingredients: lisianthus, foxglove, delphinium, phlox, nigella, roses, feverfew, and several varieties of greenery. I LOVE the colours and the dresses chosen for the bridesmaids. This is mix-matched bridesmaids done right: a light floral pattern, lace, tulle, soft pink and seafoam green. Isn't it a gorgeous combination? They look incredible! OH. And Chelsea's dress? INCREDIBLE! I couldn't find the exact one but here are a couple of similar gowns - this one in a glamorous ivory/silver combination and this one has a little more casual, feminine feel. So, then we get to the outdoor ceremony! This clearing in the woods at Pineridge Hollow is a dreamy space for a ceremony with a natural feel. They have this great 4 post birch arbor, and Chelsea asked me to make some sort of floral piece for it. I really went for it! Using cream and blush roses, light blue delphinium, and soft, sage-toned greenery, this asymmetrical floral piece was installed onto the arch for the ceremony and then re-used on the head table afterwards. 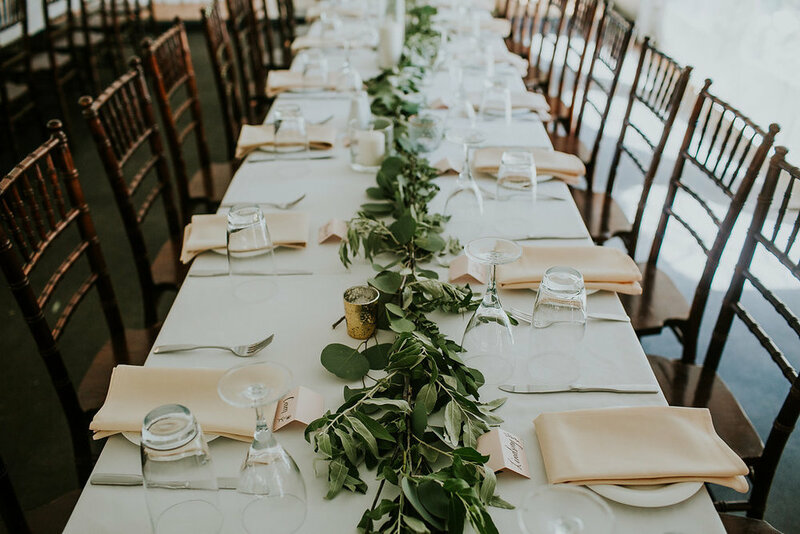 We kept things pretty simple at the reception with greenery garlands and plenty of candlelight. The tent there is so white, so my favourite things to do there are either 1) keep it really simple - aka, lots of green and white and warm neutrals or 2) go for it with a lot of colour so that the white allows it all to pop! 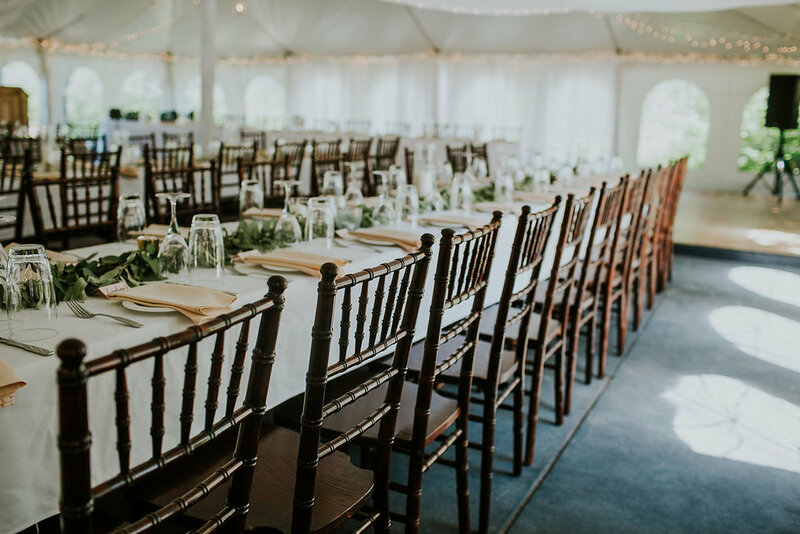 I've rounded up some of my favourite weddings at Pineridge Hollow, so if you're getting married there, check these out for some more ideas! Earlier this fall, my friend Kat Willson (and amazing photographer!) asked if I would collaborate with her on a last minute, moody photo shoot. I loved how it all came together: there was a bit of rain in the sky, the perfect amount of yellow leaves were peaking through the trees, Natalie's hair and makeup was perfect and easy, and we found a gorgeous spot in the middle of Bird's Hill Park. We even saw a little family of deer when we pulled up! As featured on Wedding Sparrow. This bridal bouquet was also chosen by Elle Decor as one of their 30 Best Wedding Bouquets! 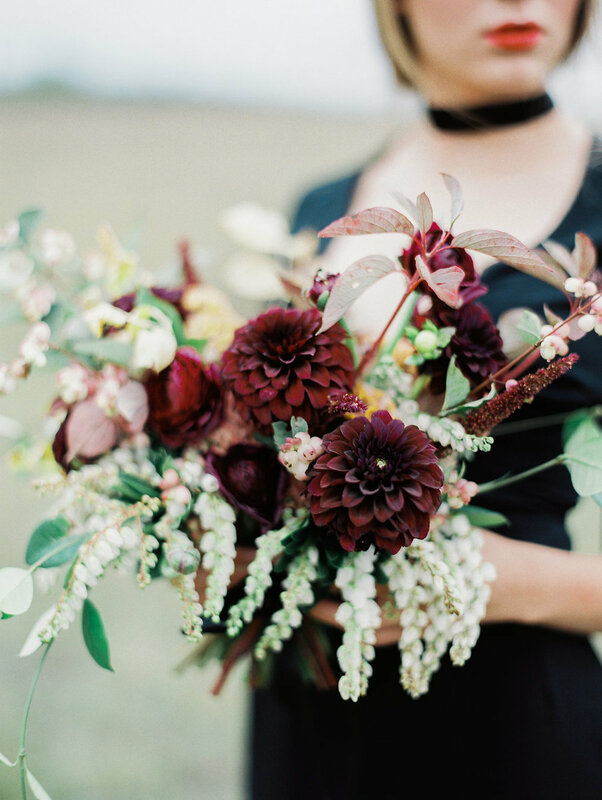 Bridal Bouquet Ingredients: Dahlias, ranunculus, snowberry, pieris, celosia, amaranthus, and foraged foliage.